Art Nouveau in Germany, Austria: History, Characteristics. In modern art, the term "Jugendstil" (in German "Youth Style") refers to a movement of 19th century German art that emerged during the mid-1890s and continued until the First World War. It received its name from the Munich periodical Die Jugend, which focused on a design style known as Art Nouveau, which was then the most fashionable type of decorative art within the gesamtkunstwerk tradition. Jugendstil evolved in two phases: a pre-1900 phase dominated by floral motifs, themselves rooted in English Art Nouveau and Japanese art, notably ukiyo-e prints; and a post-1900 phase, marked by a tendency towards abstract art in the manner of the Belgian architect and designer Henry van de Velde. See also the work of Art Nouveau architects Victor Horta (1861-1947) and Hector Guimard (1867-1942). 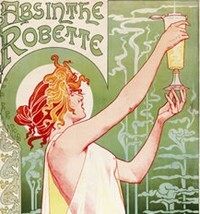 Important early influences in the development of Jugendstil included: the Arts and Crafts Movement (c.1862-1900), the expressive line paintings of Paul Gauguin (Synthetism) and Emile Bernard (cloisonnism), the poster art of lithographers like Alphonse Mucha, and the illustration of Englishman Aubrey Beardsley. Jugendstil was known as Sezessionstil in Austria, Stile Floreale in Italy and Modernismo in Spain. The Jugendstil movement was enthusiastically popularized by a number of new publications addressing both fine and applied arts, such as Pan and Die Jugend (1895-1900); Simplicissimus, founded in 1896; and Dekorative Kunst (Decorative Art) and Deutsche Kunst und Dekoration (German Art and Decoration), both founded in 1897. Support from wealthy industrialists and the aristocracy soon followed, allowing the spread of Jugendstil from graphic art to architecture and applied art. The floral style was generally sentimental and naturalistic, drawing on natural forms and folk art themes. One of the earliest examples is the embroidered tapestry art of Munich-based sculptor Hermann Obrist (1863-1927). His wall hanging Cyclamen (1892-94), depicting a moving, flowing, looping flower, reminded one critic of 'the sudden violent curves generated by the crack of a whip', and the work subsequently became known as The Whiplash. Another leading exponent of the floral style was Otto Eckmann (1865-1902), who, like many Art Nouveau practitioners, had trained as a painter but moved into graphics and applied arts. Eckmann produced a wealth of illustration in his trademark calligraphic style for such influential periodicals as Pan and Jugend. Also in 1897, a number of Van de Velde's interiors were exhibited at the Dresden Exhibition of Applied Arts. His original, curvilinear approach to furniture design was much admired and promoted by the German art critic Julius Meier-Graefe, founder of Pan, who commissioned office furniture from him. Van de Velde's popularity in Germany grew and he received numerous commissions; after settling in Berlin he lectured throughout the country. Around this time, the transformation of the floral style into a more abstract, geometrical style began to occur in work by Endell, Obrist and Behrens. Endell's designs for the Atelier Elvira (1897-98), a photographic studio in Munich, later destroyed by the Nazis as an example of 'degenerate art', were particularly important. The whiplash lines and the plant and animal motifs seen in much Art Nouveau work were abstracted, and as a result, took on an almost surreal quality. 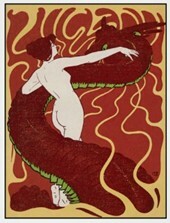 Behren's 1898 poster The Kiss performed a similar trick, its flowing curvilinear elements were simplified and controlled creating an organic, ornamental, modernist style. Around the turn of the century the Munich group dispersed, heading for Berlin, Weimar and Darmstadt. Numerous workshops were established around the country, notably in Dresden, where Riemerschmid developed a line of machine-made furniture, and in Darmstadt, where Deutsche Kunst und Dekoration was launched in 1897 with an appeal from its founder, Alexander Koch, for a return to craftsmanship and unification of the arts. Koch favoured the more restrained, elegant architecture and designs associated with Charles Rennie Mackintosh, M.H.Baillie Scott and C.R.Ashbee. He published an article on the Glasgow School of painting in 1898, invited Mackintosh to enter a competition to design a home for an art lover in 1901, and featured a magazine cover designed by Margaret Macdonald Mackintosh in 1902. See also the unique Art Nouveau architectural designs of Antoni Gaudi (1852-1926), noted in particular for his work on The Sagrada Familia (begun 1882) in Barcelona. The ruler of Darmstadt, Grand Duke Ernst Ludwig of Hesse, shared Koch's passion for British design and his belief that artists could play a valuable role in design reform. In 1899 he established a artist colony with German and Austrian architects and designers, including Peter Behrens (1868-1940) and Joseph Maria Olbrich (1867-1908) in Darmstadt. The project synthesized the Garden City ideals then fashionable in England, combining the principles of the Arts and Crafts Movement with Art Nouveau design. Olbrich and Behrens designed Jugendstil houses for the residents, and the Duke commissioned furniture for the colony from the Guild of Handicraft following designs by Ashbee and Baillie Scott. Guild members made everything from interiors to jewellery art, furniture to cutlery, and participated in exhibitions in Germany, Paris, Italy and the USA. In 1901 the buildings of the colony were opened to the public, with a mystical inauguration ceremony to demonstrate the concept of a 'total work of art' (gesamtkunstwerk), and to show how one could live an ideal life surrounded by art. The group's products were expensive, however, and beyond the reach of most. In practice, the artists survived on subsidies from the Duke. Many of the leading Jugendstil practitioners came together again in 1907 as members of the Deutscher Werkbund, continuing the debate about how to reconcile art with industry, ornamentation with functionalism. The most important legacy of the Jugendstil in Germany was the atmosphere of experimentation it fostered and the desire for a synthesis of fine and applied arts, which would ultimately lead to the formation of the Bauhaus design school under Walter Gropius (1883-1969). Jugendstil artworks can be seen in several of the world's best art museums, notably: Hessiches Landesmuseum, Darmstadt; Galerie Decorative Arts, Munich; Victoria and Albert Museum, London; and Glasgow University Art Collection. We gratefully acknowledge the use of reference information from Styles, Schools and Movements by Amy Dempsey (published by Thames & Hudson, 2007), one of the top publications on western art, and one we recommend for anyone studying Art Nouveau of the late 19th century or early 20th century.  For a chronological guide to the evolution of German painting, see: History of Art Timeline.  For information about arts movements in Germany, see: Homepage.